The history of Cashiers Valley, just like the history of this house, can be told from many different perspectives. I’ve pick out the parts that I think will give you an overview of this village’s beginnings through the early decades of the 1900s. The inaccessibility of our valley and the fact that it remained part of the Cherokee Nation until 1819, kept this area isolated and wild long after the American east coast had developed large urban cities. 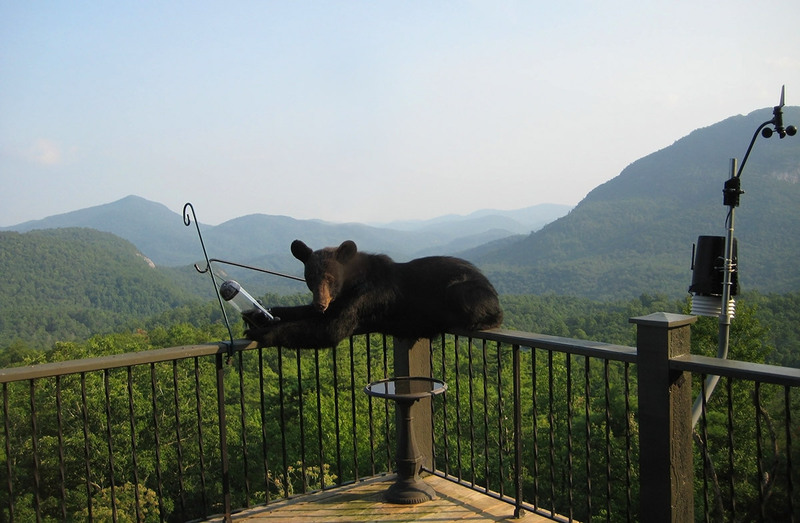 Some people still think it’s wild, especially when they see a 500 pound bear strolling across their deck. After an 1819 treaty with the Cherokee opened up this section for pioneer settlement, the land was surveyed and divided into parcels and was made ready for dispersal by 1820. By the mid 1820s, the Barak Norton family had received a land grant from the State of NC, and they were clearing land and farming in Whiteside Cove. Our own valley remained unsettled for almost 10 more years but by 1835, the Zacharys and McKinneys had claimed land between the Chattooga River and the mountains of Chimney Top and Rock Mountain. 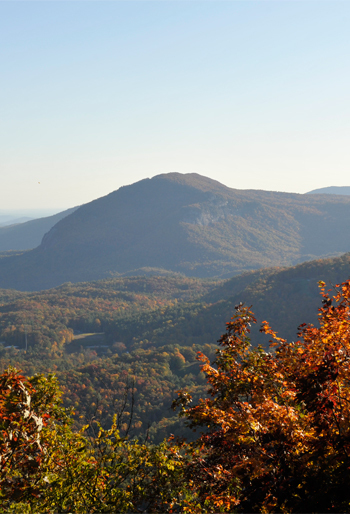 To give you a feeling of pioneer settlement, let me read you an historical sketch of the Zachary family’s trip from Surry County, North Carolina, some 200 miles away, to this wilderness which would become Cashiers Valley. All families farmed but they also were engaged in many other pursuits to make money. They boarded travelers, worked as carpenters, ran general merchandise stores, made bricks and ran lumber mills and grist mills. There was a lot of bartering and trading going on. Alexander Zachary’s general store account book dating from the 1840s shows that residents bartered eggs, hams, deer skins and days of work for manufactured items such as nails, rum, cow bells, shoe leather, salt, powder and lead and all kinds of tools necessary for gold mining. For the first several decades of settlement, there was a working gold mine on the Horsepasture River in Fairfield – today called Sapphire Valley. Traces of Georgetown Goldmine still remain to this day, under the waters of Fairfield Lake. In the Zachary ledger, under the heading of Georgetown Goldmine, men were listed buying picks and shovels and then paying for them with grains of gold dust or nuggets of gold. The Cashiers Valley Post Office was officially opened in 1839 with Jonathan Zachary as the first postmaster. In the 1880s, the word "valley” was removed from the town name and it officially became just Cashiers. Mountain farmers in Haywood, Macon and Buncombe Counties would sell their extra livestock, like cattle, pigs and turkeys, to professional drovers who would in turn drive the herds to the markets in South Carolina. One of the drovers’ routes came right through Cashiers Valley which proved to be a good place to stay overnight. Many local families charged a fee to provide the weary drovers a bed to sleep in, a hot meal, plus feed and water for the animals. Putting up the drovers overnight may be considered the beginning of the area locals catering to passers-by. It prepared the folks in the valley for the next wave of visitors – the gentry of South Carolina. The serenity and natural beauty of summer in the Blue Ridge lured the nineteenth century Southern aristocratic plantation owners, where they escaped the hot humid low country. These visitors were usually South Carolinians who came to the mountains and hunted and fished and boarded with the local families. The James McKinney house was a frequent stopping place and was remembered in a book published in the late 1800s. The 1850 federal census of Macon County, North Carolina listed 15 families in Cashiers Valley with only 11 surnames, for a total of 90 persons. Remember that originally, Cashiers was located in Macon County as Jackson County was not formed until 1851. All county records pertaining to Cashiers, prior to 1851, are found in Franklin. The 1850s was a decade that was important to transportation into and out of Cashiers as that was when the Keowee-Tuckaseegee Turnpike was built. It was a joint effort between North and South Carolina. The road began in South Carolina near today’s Keowee Lake, came up through Cashiers and then followed the Tuckaseegee River down to the town of Webster, which was the county seat. Alexander Zachary was one of the signers of the petition to the state legislature, asking for the turnpike. All male citizens who lived in the areas traversed by the turnpike, were required to give a certain number of days of work each year to keep the road in good repair. Today’s Highway 107 roughly follows the original turnpike. The decade of the 1860s was dominated by the Civil War. It was a dark time in the history of Cashiers as loyalties were sharply split in most families, creating divisions still felt today. While no major battles were fought here, each day became a battle for survival. There were attacks by bushwhackers. All cattle and horses were taken and branded with a U. S. Army branding iron. All food had to be hidden and women plowed the fields without the help of men or mules. After the first year of war, many men who had joined the Confederacy, deserted and returned home to help their families. They were called "outliers” and they often hid in caves in the daylight hours and at nightfall came down to tend the crops. The Civil War made the mountain people stand still and even back up with any sort of economic development. It took another decade to rebuild their way of life but by the 1880s, things started looking up. Investors and developers from the North discovered this remote paradise. The Lake Toxaway Company built a series of elegant Inns from Brevard up to Cashiers. Fairfield Inn, which was 4 miles from where we sit today, opened its doors in 1895. The railroad, with a spur line from Hendersonville to Lake Toxaway, had made travel to the mountains from far away feasible. Wealthy northeasterners including such names as Duke, Vanderbilt and Firestone, could ride in their private train cars most of the way. The last few miles from Toxaway to Cashiers were made in horse-drawn conveyances. Once again, we see the influence of the moneyed outsiders. The railroads also made possible the exploitation of the area’s majestic virgin forests. The logging companies were predominately owned by large companies, not of local origin, but for at least 50 years, logging impacted every local family in some way. About the time of World War I, Tom Dillard got a job in Pisgah Forest with a logging company. For a time he left his family in Cashiers while he worked in the forest near Brevard, but later he brought the whole family with him. They were fixed up with housing near the logging site. His oldest daughter provided schooling to the children of the loggers. Some of the logger’s wives acted as cooks for the loggers. Yes, logging was a strenuous, dangerous job but provided the families a decent income. The next occupation in the mountain area was the growing of cabbage. Where you see today rolling fields of Christmas trees, you once would have seen cabbages. Hamburg cabbages were especially in demand and 18-wheelers from all over the southeast came to the Cashiers area, loaded up with Hamburg cabbages and took them to the city markets. It was in the 1920s that the Wade Hampton property transferred into the hands of the McKee family and High Hampton was created. Many local families still followed the custom of providing room and board to summer visitors, who often stayed the whole summer. Tourism has remained an undercurrent in Cashiers, throughout its history.